I like to periodically discuss different ways to earn free airline miles. These free miles are equal to free money, and will add up to help you on your way to earn free travel. Audience Rewards offers an easy way to earn free miles every few weeks. 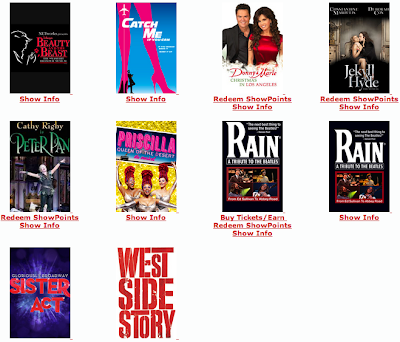 It is the first national rewards program for the arts and the Official Rewards Program of Broadway. With Audience Rewards you earn 2 types of rewards: ShowPoints and partner points with partner programs including: Delta, United, US Airways, Starwood Preferred Guest, and more. I won’t be reviewing the Audience Rewards ShowPoints program here, but you should know that awards can be redeemed starting at 500 ShowPoints. Today, I will go over how you can easily earn a few free points and miles with: SPG, Delta airlines, and US Airways programs with just a few moments of your time. I highly recommend signing up for each program with a separate email login dedicated to each program because it is an easier way to earn points without confusion. Once you login, go to Partner Points and find your associated program to login and start earning via the Points Play program to earn points by answering Broadway trivia questions. To earn Delta Skymiles, go here. To earn US Airways miles, go here. To earn SPG Starpoints, go here. 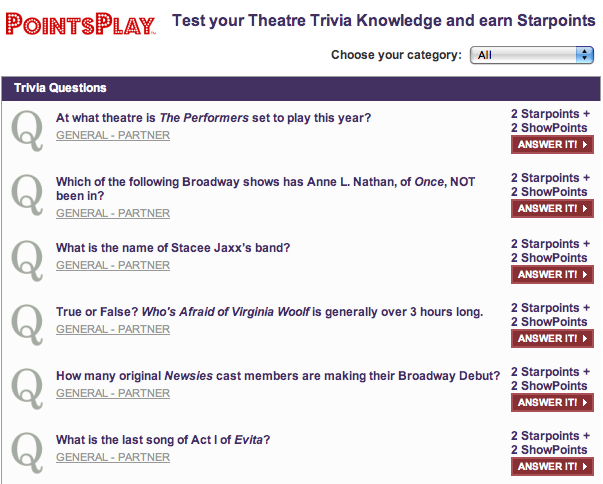 New questions are posted every few weeks and you can easily earn 12 points per Points Play trivia set of questions. Once you answer the questions correctly you get points and miles deposited to your partner program within 4-6 weeks. Now it can be difficult to keep up to date on when new questions are posted, so let me highly recommend the inacents blog. I sign up for their email updates to not only tell me when Audience Rewards posts new questions, but also tells me the answers to those questions!! You can read more at the blog’s Points Play trivia page. You can see the inacents blog for more details on how to sign up for other partner programs to earn free points aside from the Delta, US Airways, and SPG programs that I discussed today. Once you get signed up for each program, simply wait for an email from inacents blog and then log in to each account and collect your free miles and points. It is extremely easy and only takes a minute or two to start earning. You can join audience rewards here. Have fun. Awesome blog, keep up the work!